Function Central is the leading live music entertainment agency in London, offering the very best live music at unbeatable prices. We only work with London bands, musicians and DJs of the highest calibre; all acts are strictly vetted before being accepted onto our books, and we continually monitor artist performance to ensure that you get only the highest quality, most professional entertainment on the night. We have access to a wider range of live music acts than any other entertainment agency in London: choose from our huge selection of rock bands, jazz bands, ceilidh bands, jive bands, Latin bands, DJs and more, or browse our sample selection of London wedding bands, musicians and DJs below. On each act page, you can listen to audio clips, view pictures and read feedback from previous customers. Booking is quick and easy: if you like an act, use the ‘add to my enquiry list’ function to put together your own shortlist. We'll get straight back to you to confirm prices and availability, then draw up a secure contract to cover you against any eventuality. Our price promise means makes us the best value entertainment agency in London: if someone else offers you a better price on your act, we'll match or beat it! And that's just the beginning: we're the one of the few entertainment agencies in London to provide first-class customer support right up to the day of your event. We specialise in London wedding entertainment, parties and corporate events, but we also offer services throughout the country, including Manchester, Liverpool, the Midlands, Yorkshire, Wales and the South West. Also see wedding bands in London and DJ hire in London. Exciting new party band The High Rollers specialise in classic indie rock hits by The Killers, Blur and The Kinks as well as brand new pop hits by Bruno Mars, DNCE and Pharrell Williams. Cool and classy trio playing jazzy versions of pop songs as well as jazz standards, from Frank Sinatra to Ed Sheeran. Available as an instrumental ensemble or with a male vocalist. 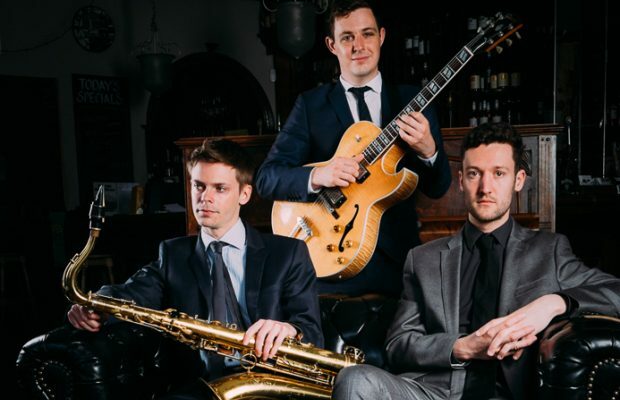 Young, professional jazz trio and regulars on the London jazz scene, The Richmond Jazz Trio perform jazz classics by Duke Ellington, Miles Davis and Louis Armstrong, and many more. Exceptional jazz and swing trio with an extensive repertoire of classic jazz tunes by the likes of Louis Armstrong, Ella Fitzgerald, Frank Sinatra, and George Gershwin, plus an optional pop repertoire. Suitable for elegant background music or with drums and vocals for evening dancing.